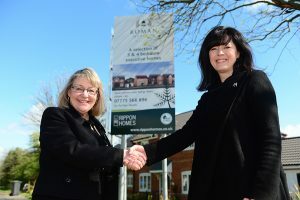 Leading housebuilder Rippon Homes has joined forces with social housing provider Acis to bring affordable homes to its Roman Meadow development in Welton near Lincoln. Nine plots are to be transferred to Acis on the very popular Roman Meadows development located on Hackthorn Road, Welton. Ian Dyke, Managing Director of Rippon Homes, said: “We are so pleased to have teamed up with Acis to bring affordable houses to Welton. “This will bring much needed, quality built homes to the area that will be available to those in housing need. Andrea Brough, Head of Development at Acis, said: “We are delighted to work alongside Rippon Homes to develop these quality new homes. Located eight miles north of Lincoln, Welton is a friendly village with a thriving community, a broad mix of shops, amenities and leisure activities, including golf, fishing, riding and sailing. Acis will have five homes available for affordable rent and a further four properties available to purchase under its popular shared ownership scheme. Visit www.acisgroup.co.uk for more information. For more information on the homes for sale at Roman Meadow or any other Rippon Homes developments, call 0800 1697644 or visit https://www.ripponhomes.co.uk/.